Today, I discovered the key to being on-task while writing or revising academic papers — find someone in the computer lab or library, who looks like s/he will be working there for the next 3 hours, and sit next to her/him. I never thought of this before. Before this, when I needed to get some serious writing done, I was usually either in my room or at a quiet spot in the library. But I struggled to even get started. This afternoon, while I was in the computer lab, someone sat next to me and he was diligently working. Somehow that rubbed off on me, and I managed to revise my introduction in 4 hours. So, that is what I will do from now on – look out for diligent-looking people. 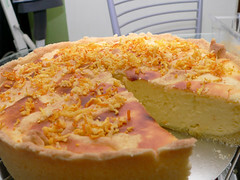 Since I completed my work for today, I can have a guilt-free blog entry. A birthday cheesecake courtesy of my brother Aaron to a special 17-year-old. When I came home from school, 16 years and 9 months ago, and found a little baby in my house, I did not know then that God has great plans ahead for the two of us. Two hundred and one months later, though we are not blood-related, our lives are still linked together, and we would both be far away from our home. As a young boy, Joseph was sold as a slave by his brothers. He spent many years in jail; falsely accused and forgotten by the people he helped. However, we now see the hand of God on Joseph’s live, and how he rose to the top and became Pharaohâ€™s right hand man. Because of Joseph, many lives were saved – including his own family. These young men were taken into captivity to Babylon. They probably had to learn foreign stuff, e.g., languages, custom, law, knowledge base. However, they did not compromise their faith. They too rose up to great ranks and did many great things. This beautiful young woman, too, was taken away from her home. She was placed in a palace and later became a Queen. Yet, she did not forget her people and her God. At a very difficult time, she risked her life to save her people. This young woman, chosen to carry the Son of God in her womb, had to leave home with Joseph and spent years away to save her baby from the ruler of the land. I am sure all of them missed their home, i.e., family, friends, food, and familiar sights and sounds. Even though some of them were placed in palaces, I am sure they all suffered hardships, e.g., being in a different culture, being misunderstood, sticking out like a sore thumb. I am sure they wondered why this had happened to them. I am sure they wished that something would happen so that they could return home. Although they did suffer being away from home, it was not in vain. God was still in control. He was always with them. By being faithful, they allowed God to do great things through them. I caught this video while at the Detroit Metropolitan airport. Very unique and sort of uplifting for the travellers. As early as November, I started looking for a snow shovel, anticipating that I will have to dig my car out soon. 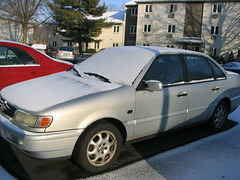 It’s after mid-January now and this is the first accumulation of snow on the car. I’m not complaining though. Officially, it had snowed twice here, both times, early in the morning and leaving just a light covering of snow. And both times, I missed it…still sound in bed. The semester has started. After checking out the prices of the textbooks that I needed at the bookstore, I bought my books from Amazon.com, saving me $15. This semester I’m taking the dissertation proposal seminar. Basically, it’s a class to push us, students in the 4th year, to get a working draft of our dissertation proposal done in 14 weeks. According to the professor, we should set aside 20 hours a week for the next 18 months to get our dissertation done. And weariness descended on all our faces. I almost didn’t get my driving license because I parallel parked so poorly. And since I started driving I don’t really ever need to do that (or maybe I just avoided it). Last night, when I reached Becky’s place for the bible study, I saw a spot near her house. Since there was no car behind me, I thought I would give it a try. I tried to back in twice but couldn’t do it. Gee, I must be really bad at this, so I left and found another spot that I could drive straight in. Later at Becky’s place, Erica and Rebecca came in and Erica asked me if I had parked outside because she saw a car with the headlights on. I proceeded to tell them about my parallel parking failure, and guess what? Both Erica and Rebecca also tried to park in that spot but couldn’t as well. So maybe I’m not so bad after all. Now I just need to learn to estimate correctly, and remember that I’m driving a Passat, not a Kelisa. I sent a bunch of Christmas cards on December 13, and my brother in KL received his, 2 days after Christmas (2 weeks), and it took over a month for my cousin in Penang to receive hers. What an amazing range! Here is the korean fare that I had last night: korean bbq beef and pork, hot pepper stew with fishcake and ricecake, jabchae, red bean glutinous porridge, seasoned ikan bilis, cabbage kimchi and radish kimchi. And it is all good. I did manage to watch Aunty Han make her jabchae, so I’ll try that one of these days. This morning, Aunty Han was busy making radish kimchi, and she also took out the not-very-good kimchi that I made some time ago and re-seasoned it for me. I think the more times I try to make kimchi, the worse it tastes. I added one very expensive korean pear, supposedly the secret ingredient, to my latest kimchi. 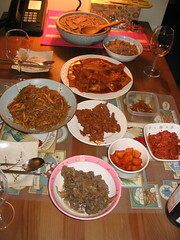 But this batch turned out to be, I have to say, the oddest tasting kimchi that I’ve made so far. Brought along to the library, the macbuku, some reference materials and my draft with my advisor’s scribblings, I mean comments, to get some serious work done. Met Victor online and then proceeded to follow him follow the Macworld live online..very impressive new gadget, the iPhone. Needless to say, not much serious work done yet. 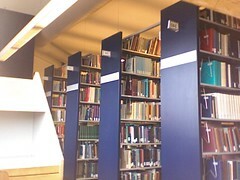 Since I’m already off course, might as well take a picture of the library shelves with the iSight, and blog about my off-taskness. This evening, ahm-jeum-ma (Aunty) Han, my roommate’s mom, is cooking an authentic Korean dinner of Jab-chae, korean bbq and a red bean something. I hope to get home in time to watch her make the Jab-chae. Following the advice of a friend, I decided to have my own Christmas party, instead of waiting for some invitations. I invited the other Malaysian students and some other international students, but only three person confirmed that they were coming. The day before the party, three more were added. On the day itself, two additional people came. 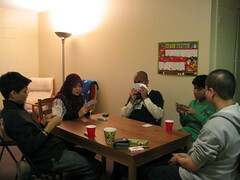 So altogether, 8 guests: Ika, Su, Jimmy, Din, Loon, Nazir, Ali & Steve. Including me, 5 Msians, 1 Sri Lankan, 1 American, and 1 from Maldives (Maldivian?). Dinner consisted of curry chicken, tomyam beehoon, fried rice and salad (lettuce, spinach, grape tomatoes and cucumber). Din brought along his specialty, kuih kodok, and Steve brought a big box of assorted cookies and cakes. 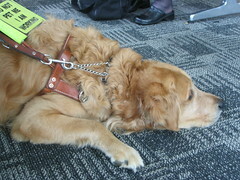 While I was at DTW waiting for my flight, Randy, the working golden retriever, and his owner came by and sat next to me. He was very beautiful and obedient. When it was time to board the plane, Randy was almost dragging his owner to the plane. I spend Christmas day with PCNAT at their friend’s place. That family had a black labrador but I’ve forgotten the name. Unfortunately, I did not managed to take a photo of that dog. The day before I returned, I visited a dairy farm with PCNAT. 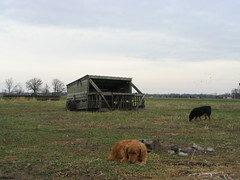 The farm dogs, Libby (the very fat golden retriever) and Daisy (a black mutt), were accompanying us on the farm tour. Libby was carrying around and chewing on a deer leg! The fur and skin were still on one part of the leg. It was quite a funny – the sight of her running around with a deer leg dangling from her mouth. I spent several day/nights being dogsitters with PCNAT. 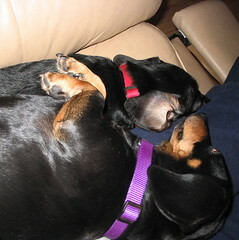 The dachshunds, Sayde (purple collar) and Stella (red collar), were really adorable. Both of them were so contented just laying down by our side. They were also masters at seeking out food items when we were not around. We lost half a pack of Pringles, one christmas cookie, and several bits of chocolates to them.